Got info from QHY: There will be a new driver in couple of days to address the USB2 issues if you have experienced such. Big thanks to you guys for posting, testing, sharing info on the new camera(s). I read about certain halo problems with bright stars, i was pleased to see none in m45 here, but i am curious as to whether any had shown up in others images. I saw a Horse head image with a large halo, but it could be down to the filters used, its hard to tell from a processed image. It seems to be something that (unsurprisingly) cannot be fixed with a driver update, which is a concern. Sorry to jump in on the thread, i am just hoping to hear more on the new camera, and specifically regarding the halos. Edited by Aenima, 11 January 2017 - 03:11 PM. It's related to distance between the glass surfaces (filter to sensor). 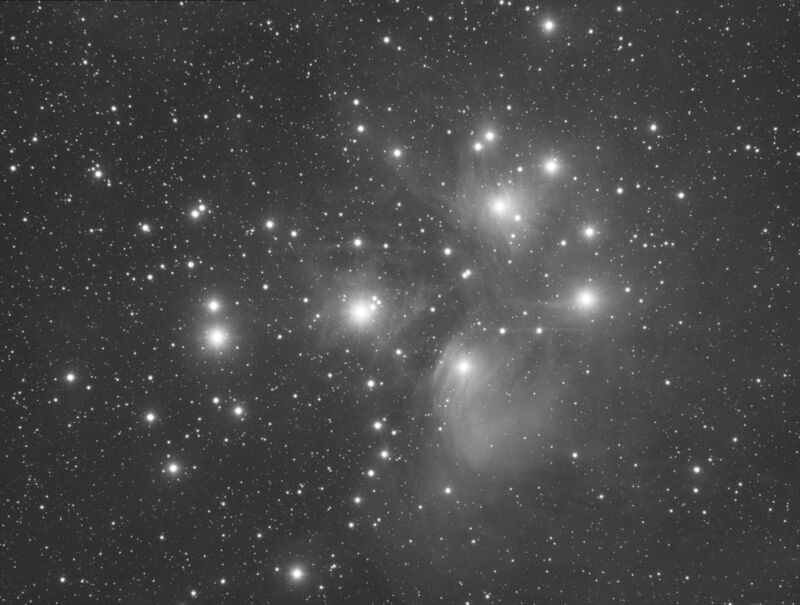 I used rather long spacer taking that M45 image and subs were completely clean. Herra, what filter wheel are you using with the qhy163m? It's a manual 4 slot 2" filter wheel. Enough to hold luminance and S-Ha-O set. There is a 72.2mm back focus after the reducer and this train makes it 72.5mm. I extended it with 0.3mm to compensate the NB filters though. Edited by Herra Kuulapaa, 13 January 2017 - 02:38 AM. 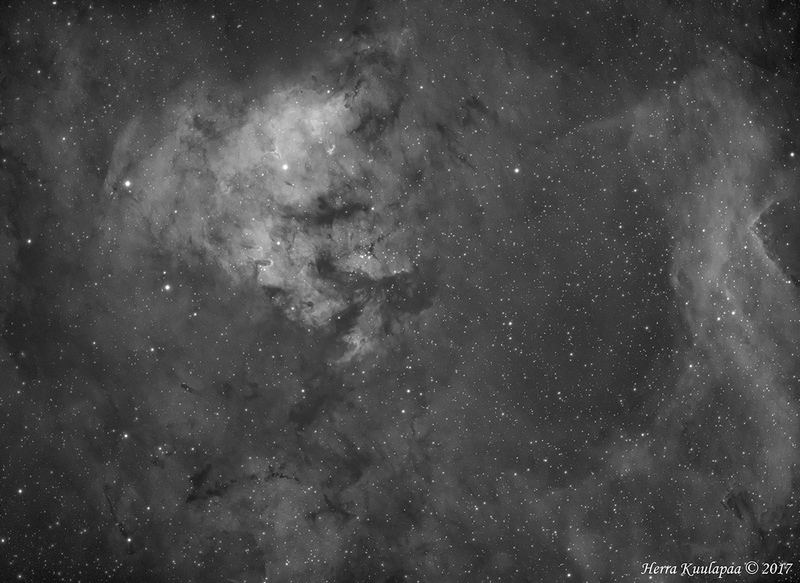 Tak f/3.65 & QHY163M, gain 20, OS75, H-alpha, 10x10s, 10x30s and 10x180s - Decided to leave core natural bright rather than over flat. 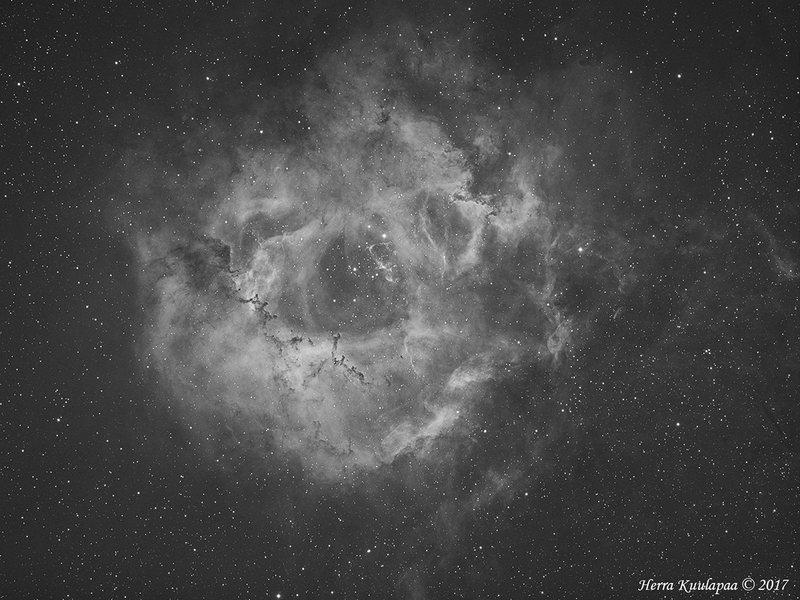 I have my main sequence from last night still in process; Rosette. Also it has a bit too little light. Main purpose is to test how far I can push the data though. EDIT: it was enough in the end. Edited by Herra Kuulapaa, 20 January 2017 - 12:07 PM. Here's more adequate amount of exposure data. You don't seem to have the microlenses reflections issue as I do, so this should be a combination of filter / filter to sensor distance / optical formula used (with or with no reducer etc...). I should try to find a way to mount the filter further away from the sensor and see if it helps. I noticed the small reflection you have. It should clear with increasing the distance though. How close is it right now? Edited by Herra Kuulapaa, 28 January 2017 - 10:35 AM. I had my first light ever with mono and my 163M a few nights ago. I seem to be having some issue with the reflections. I'm not sure what might be the cause. Focus could be a little tighter. Do you think that could be it? This is my luminance image of 9 x 180s at gain 5 offset 40. It seems its caused by microlenses on the sensor itself - apparently its quite common, although i've seen a lot of great images from the KAF8300 sensor with minimal reflections, so i am guessing there are certain situations and equipment combinations that make it worse. I really disliked the effect however, and will not be using the QHY163m - hoping the older QHY9 (kaf8300) camera is less prone to severe reflections, despite also having the microlenses.? If anyone has experience with this it would be great to hear from them. I get the reflection on my camera also. The SBIG 8300C doesn't have it though. How close is your camera to UV/IR filter or any other reflecting/refracting surface? Increasing the distance (if possible) reduces the hall of mirrors effect and can help to reduce halos. Thanks for the tip. I need to use an 8mm spacer to achieve 55mm bf for my setup. I tried moving the spacer just in front of the camera (between camera and FW) and couldn't reach focus with my OAG. I might be able to do it with two smaller spacers or just try exposing for 2 mins instead of 3 mins. But first, I have to wait for clear skies which may be awhile! I was talking to Tolga and I'm going to bump the gain and try shorter exposures see if that fixes it. I have a feeling that it may not help much. 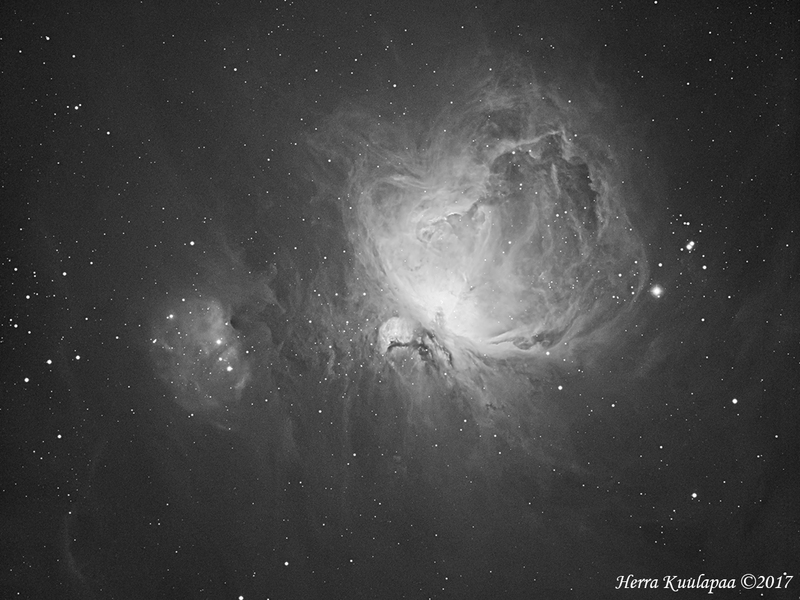 Same data will be there with 2min than what it does with 3min, only with a bit weaker snr. So, reflections will stay the same as long as you keep the same optic setup. 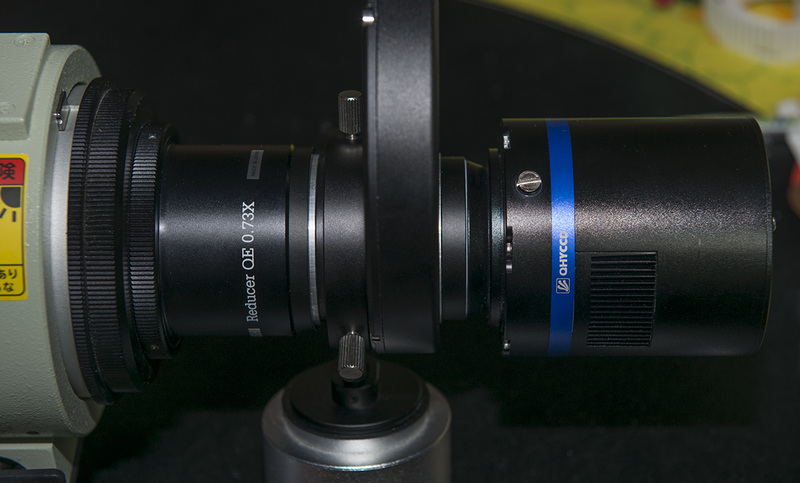 55mm is a very tight back focus to fit OAG and everything. Hope you can tweak your setup enough to keep those reflections at bay. 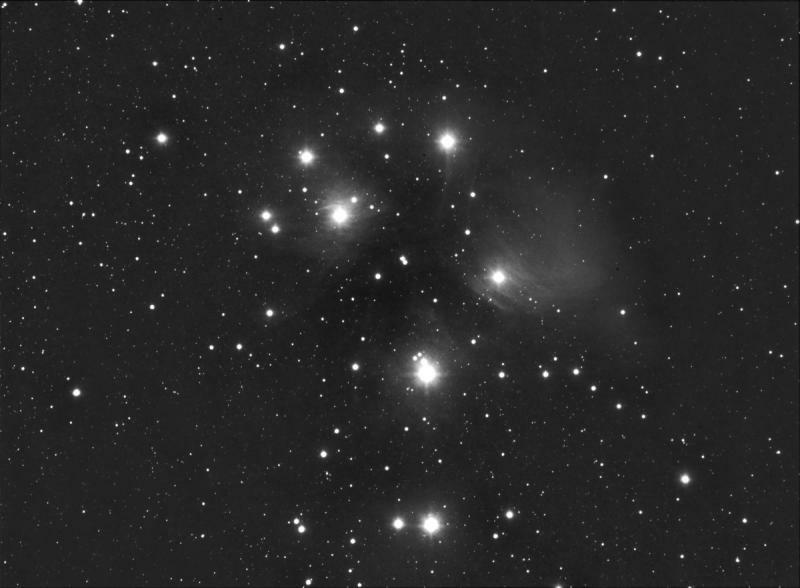 BUT I don't really see camera caused reflections in the M45 image. EDIT: ok, maybe something small, but it's hard to see them. Edited by Herra Kuulapaa, 04 February 2017 - 10:59 AM. Which OAG is that? ZWO?